The victory spoils the Bearcats’ chances of clinching the Mid-America Intercollegiate Athletics Association title and gives the Tigers a chance to win their second-straight title. Here are five takeaways from what is quickly becoming a fun rivalry in the MIAA. One point. That’s the margin of victory of both Fort Hays State victories over Northwest Missouri State the past two seasons. Last year, the Tigers won 13-12 to lock up the MIAA title. This season, Dante Brown’s third-quarter field goal was the difference, giving Fort Hays State the 17-16 win. Northwest Missouri State is a remarkable 25-2 at home the past four years, obviously helped out by those consecutive undefeated 15-0 national championship seasons in 2015 and 2016. 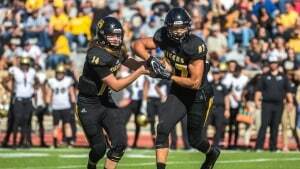 Both of those losses came at the hands of Fort Hays State. Dating back to its last home loss in 2014 before the Tigers figured out the riddle of Bearcat Stadium, Northwest Missouri State had won 21 straight in Maryville. That’s utter dominance and makes what the Tigers have accomplished even more astounding. Fort Hays State rushed for 12 yards. The whole team, twelve total yards. That’s it. That marks 51-straight games since the Bearcats last allowed a 100-yard rusher. Red-shirt freshman Chance Fuller threw for a career-best 274 yards last week versus Lindenwood. This week, he was called upon to make his first start, and while it wasn’t perfect, he certainly delivered. Fuller completed 62.9 percent of his passes for 240 yards and two touchdowns. He had some difficulties against this Bearcats defense, throwing three interceptions, but then again, who doesn’t? If this was a glimpse into what the future holds for the Tigers, they are in good hands. On the other side, the Tigers were able to handle the Bearcats redshirt-freshman quarterback sensation, Braden Wright. Wright — who is having a breakout season, tied for second in DII football with 11 rushing touchdowns at the quarterback position — threw for just 117 yards and one touchdown while rushing for 13 yards. The passing yards were Wright’s lowest output of the season, while the rushing yards tied his lowest mark in 2018.